Over the last decade, Internet film sites have displaced reference books as the primary source of classic film information. While I appreciate having access to an expansive virtual library, I always approach its content with some caution. Popular sources, such as the Internet Movie Data Base and Wikipedia, are written by... well...anyone who can log into their sites. I like to balance what I learn from those sources with what's available in reference books written by film literature professionals. Over the next year, the Cafe will periodically review what we consider to be some of the essential reference books on classic movies. This month, we'll start with seven film encyclopedias. 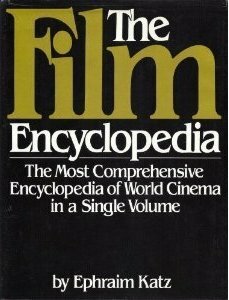 The Film Encyclopedia by Ephraim Katz - First published in 1979, Katz's mammoth book is universally recognized as one of the finest film references--with accolades from Library Journal, Newsweek, and even Katharine Hepburn. It's not a book of film reviews, but rather an encyclopedia with entries on performers, filmmakers, studios, film terms, and even short histories of the evolution of cinema in various countries. It's noted for its accuracy (indeed, I've used it for four decades and found one error). Katz, who was also a documentary filmmaker, died in 1994 before completing a second edition. It has been updated by others since, but I recommend seeking out Katz's original edition. 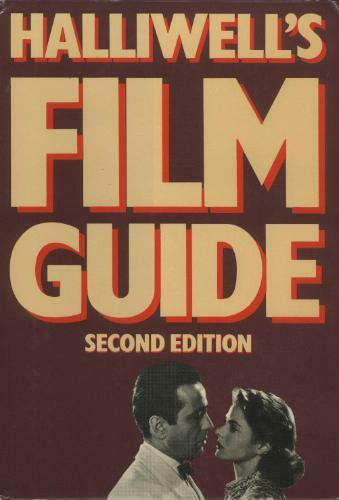 Halliwell's Film Guide by Leslie Halliwell - Halliwell was best-known for writing The Filmgoer's Companion, one of the first important film reference books. But since there's a good deal of overlap between it and Katz's even better Film Encyclopedia, I recommend adding Halliwell's Film Guide to your library. First published in 1977, it's an incredible collection of capsule film reviews--all written by one person! That's why the Film Guide is superior to rivals, such as Leonard Maltin's books, which are authored by panels of film reviewers. Some critics claim that Halliwell's personal prejudices are a detriment to his reviews. I strongly disagree for two reasons. First, I often agree with Halliwell. More importantly, those "prejudices" provide the book with a singular point of view that gives it a consistency missing in other books of capsule film reviews. As with Katz's book, I recommend you steer clear of later editions updated after Halliwell's death in 1989. 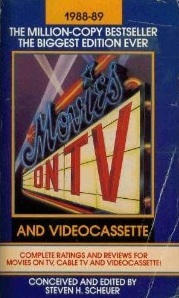 TV Movies by Leonard Maltin - No, the title is not a mistake. 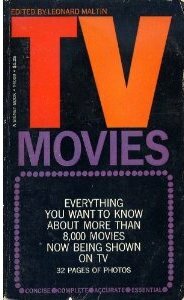 The best editions of Maltin's book were the earlier ones called TV Movies and later TV Movies and Video Guide. These editions contain thousands of capsule reviews, generally ranging from the start of the sound era and ending nine or so months prior to publication. They include made-for-television films, as well as reviews of film series such as Tarzan, Maisie, and Boston Blackie. Maltin did not write all the reviews, but selected a panel of collaborators to assist him. As he continued to add movies each year, the book eventually became too large and, unfortunately, many older reviews were relegated in 2005 to a separate volume called Leonard Maltin's Classic Movie Guide. I recommend you seek out an older edition of Maltin's book. Movies on TV by Steven H. Scheuer - Although many people think Maltin pioneered the capsule film review encyclopedia, that honor goes to Scheuer. He published the first edition of Movies on TV in 1959, ten years between Maltin's TV Movies. As a youth, I regularly consulted both Scheuer and Maltin--it was always good to get a second opinion on a movie. Scheuer stopped updating his book in 1993. 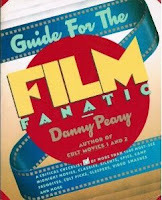 Guide for the Film Fanatic by Danny Peary - Although Peary is better known for his books on cult movies, I prefer this quirky encyclopedia of pithy reviews. Peary includes a healthy mix of classic American movies (Way Down East, The Letter), foreign-language films (The Conformist), British and Australian cinema (My Brilliant Career), cult movies (Queen of Outer Space), and even famous adult films. His reviews are longer than those in the books by Halliwell, Maltin, and Scheuer. And, although his approach could never be construed as academic, Peary offers an occasional fresh view on a popular classic. 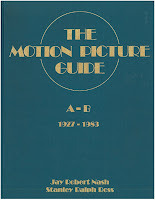 The Motion Picture Guide by Jay Robert Nash, Stanley Ralph Ross, and Robert B. Connelly - A true encyclopedia, the 1985 edition of The Motion Picture Guide included 25,000 in-depth reviews in ten volumes. A later volume added 15,000 silent films. A huge undertaking, it's a shame that it wasn't updated over the years. Still, what was once an expensive purchase only for libraries, can now be bought used for under $100--and you still get all the classic films plus fabulous write-ups on many film series. 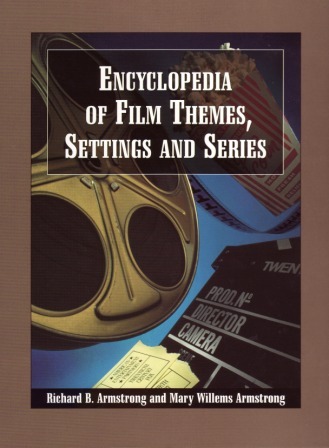 Encyclopedia of Film Themes, Settings and Series by Richard B. Armstrong and Mary Willems Armstrong - For personal reasons, I'll keep this write-up brief. However, if you are looking for a reference guide to films by category, this book is your best bet. In other words, if you can't recall the name of that movie about reincarnation, you can look the topic up and find a list of representative films, along with a brief overview of the category. There are over 670 categories, ranging from the Abominable Snowman to Zorro. When originally published as The Movie List Book in 1990, Library Journal called it "the most important film reference in several years." Great story - I love the internet for it's quick informaion, but there is nothing like sitting down with a good movie reference book and losing yourself for hours! Rick, I own only one of these. Some don't particularly appeal to me, but the one by Ephraim Katz does. I was just barely aware of it before reading this but have just ordered it. I've owned the similar Leslie Halliwell book for years and have referred to it so often it's falling to pieces. I also like David Thomson's "Biographical Dictionary of Film." (I have the "new" ed. circa early 2000s.) It's hardly comprehensive and of course quite opinionated but still a good supplement to more complete works, and it has the advantage of expressing the views of one person with a vast knowledge of film. IMDb is a great resource, but it's also nice to have a reference book at hand for quick consultation or to see what someone whose likes and dislikes I'm familiar with thinks. I agree with David re: internet & quick info, but there really is nothing like an actual book. This winter my husband & I were in Hollywood and I dragged him to Larry Edmunds bookshop. What a fabulous place! I grabbed all the books I could carry and I've been savouring them. 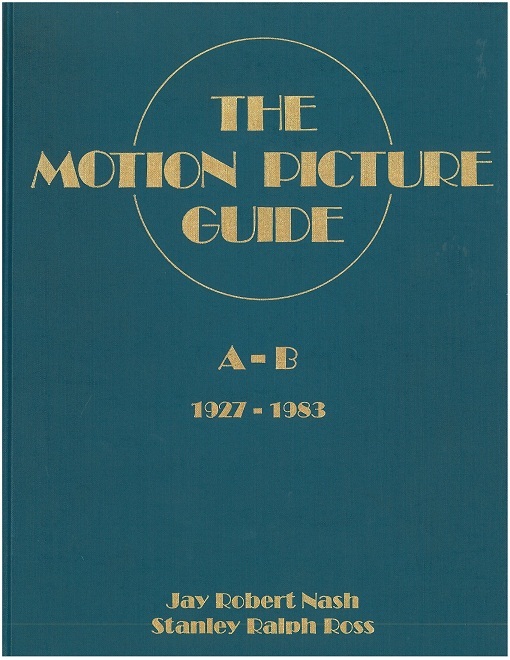 The The Motion Picture Guide by Jay Robert Nash, Stanley Ralph Ross, and Robert B. Connelly. Catches my eye.. Thanks so much for this essential list. I've been buying up books on classic film as quickly as I can find them as of late and especially the series on each studio and it's history, film catalogs but I'll add a couple of these to my list. To my surprise, several years ago Blockbuster had a thick paperback with a list of all films with great descriptions and they can be referenced via the title or by director or actor. I find myself picking that book up from time to time. Of the ones you've listed here I have Halliwell's Film Guide. "Leslie" and "Leonard" were our family's bibles when I was young. If we all get our information from the internet, we're just telling each other the same thing - only that which is found online. We'll always need books to expand our knowledge. Oooh, Rick, I will definitely keep these in mind when next I have a bit of extra loot. I do have a few movie reference books on my shelves, but nothing as extensive as those on your list. Thanks so much for this post. I'm with Caftan Woman by the way. We will always need books to expand our knowledge. Rick, great idea for a post and a super selection of some of the essential reference sources.I'll look forward to your other selections over the following months. What a fantastic idea, Rick. Thanks so much for posting this, all valuable recommendations. It's difficult to determine which sources are worth your while when starting from scratch. I couldn't agree more that books are the best way to find out real information with some depth. The internet is fine for research, but it isn't always accurate, nor does it have the soul that a book can offer. Wonderful list of books I would like to read. I'm embarrassed to say I don't own any of these...more books for my wish list. This is a very solid collection of film references. I have used each of these over the years and own several of them. I especially liked your comment about Leslie Halliwell's work. Once you learn an author's likes and dislikes it truly helps you determine whether or not you might share his opinion on an unknown movie. Great post, Rick! I have another one to recommend. "The Hollywood Reporter Book of Box Office Hits" by Susan Sackett. There are stories about each of the top five movies of the year from 1939 to 1996 (The box is now out of print, though). Not sure if anyone here has it or not. Great coverage here..we own most of these books ( except The Motion Picture Film Guide...I'll have to hunt that one down! ) and we have to agree with you in saying that Halliwell's Film Guide is head and shoulders above of the rest. I only wish it covered as many films as Maltin's Classic Film Guide.